You are welcome to come to the conference and enjoy our community. There is no cost to come through the doors and enjoy the ambiance of the conference. The Temple where you experience a private appointment with our professional Healers, Psychic Readers, and Body Workers. Community Area & Concessions – enjoy a cup of coffee, tea or treat as you relax in the community area, contribute to the poetry wall etc. You can also enjoy a quiet moment in the Pink Tent! Chairs are available in every workshop. We also have a downloadable What To Bring list that includes information about materials fees and items recommended to bring (if any) for all the workshops. We will have light snacks and water available at the convention. If you have dietary concerns or desire a more substantive meal we have prepared a document you can download with a list of local restaurants within a mile or so of the campus where you can go for lunch or dinner. The list includes contact information and driving directions from the campus. There's also a local delivery service that will deliver foods from various restaurants to you called BiteSquad. Certificates of attendance are available. There is a fee of $10 per class to receive the CEUs. You can pay for the certificate at your workshop, please ask the workshop facilitator for assistance. 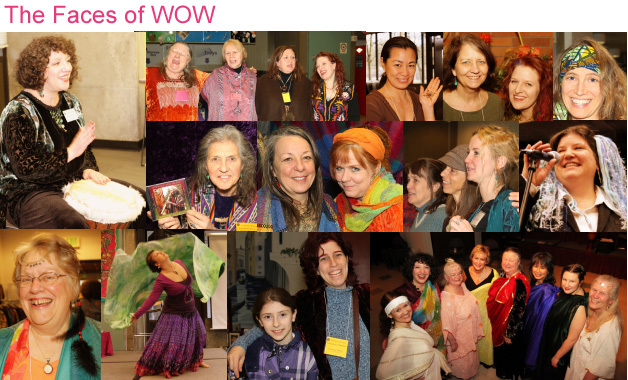 ﻿We appreciate everyone’s support towards the mission of WOW and hope you will become a member! We are a 501(c)(3) nonprofit organization and your contribution is tax-deductible. Memberships begin at $35. Women of Wisdom will be taking photographs and some video during the conference and utilizing them in our news or promotional material, whether in print, electronic, or other media, including the Women of Wisdom website. By participating in the 2016 Women of Wisdom Conference you grant Women of Wisdom the right to use your photograph for such purposes. We respect any requests for privacy, so please let us know if you wish to remain anonymous and/or not be filmed/photographed. You can inform the workshop facilitators or the photographers/videographers when they arrive. Filming and photographs will not be taken during intimate sharing times. We are striving for a fragrance-free event to accommodate attendees with asthma and chemical sensitivities (and to improve awareness for all people regarding fragrance chemicals). Thank you for not wearing perfume, cologne, or other scented products. Throughout the conference, our professional counselors are available for guidance, crisis intervention, and processing your emotions. There will be a sign up sheet in the counseling corner of Frigga's Hall. We welcome counselors to share their gifts at the conference and provide assistance to anyone in need. If you are interested, please contact WOW at wow@womenofwisdom.org. You are welcome to bring your fliers, brochures, and business cards to set out on the networking tables in the college center building near registration. Please do not include any give away items that are scented. We at WOW are so excited about the conference and we love the creativity that is expressed by you lovely wise women, so be sure to share some of your creativity with all of us. The poetry "wall" is next to the Information (Temple of the Oracles) desk. You can compose a masterpiece, a lovely scribble, or bless us with a Haiku. Chalk is provided to use. Have Fun!